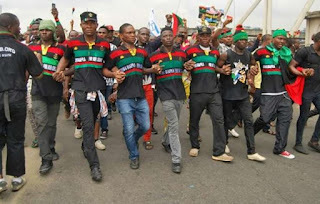 NNEWI, NIGERIA (INDEPENDENT NEWSPAPERS) – In a resumed bid by the Indigenous People of Biafra (IPOB) to ensure the boycott of the Anambra state November 18th governorship election, the organization has flooded Nnewi, Onitsha and Okpoko with posters urging people not to participate in the election. INDEPENDENT investigations show that posters urging the boycott were pasted on different points of the three cities, with residents saying that the posters started appearing about two days ago with the identity of the people behind it unknown. According to the posters which can be seen in different streets of the three cities with the picture of the Late Chief Odimegwu Ojukwu the former defunct Biafran head of state and Mr. Nnamdi Kanu as well as the channel address of radio Biafra donning it, IPOB urged the entire residents to sit at home and boycott the election with such messages as ‘No Election On November 18th’, ‘On Biafra Referendum We Stand’, ‘Sit At Home On November 18th’, among others. Reacting to this development, a community leader and Igbo chieftain in New Haven Estate Nkwelle Ezunaka Oyi LGA, Sir Silas Ikeh, described the latest campaign to boycott the election as uncalled for and opined out that it will not be in the interest of Igbos and the entire South East for the election not to be conducted in Anambra, and urged the people to disregard whatever move IPOB is making to persuade them to boycott the election, even as he called on all the voters in the election to come out massively and vote in the election. 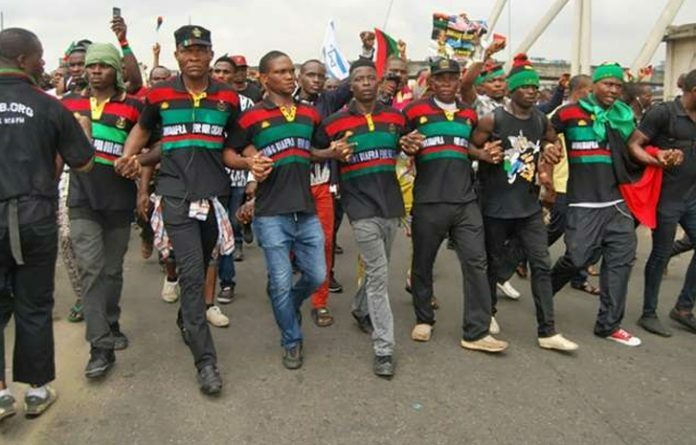 Also reacting to the incident, the Civil Liberties Organization (CLO) in Anambra state cautioned IPOB and all those calling for a boycott of November 18th election to desist, noting that it would be detrimental, and despicable if they boycott the election. Civil Liberties Organization (CLO), which made this known through a release signed by the state chairman of the body Comrade Vincent Ezekwueme, Publicity Secretary; Comrade Nicholas Amoke, made available to newsmen in Nnewi, also urged every citizen of the state to participate in the election just as they advised the people to vote for a candidate that will be responsible for their welfare.